Very true. This is why I (hopelessly) advocate for an amendment to the U.S. constitution (and a change in any other country facing this problem) that disenfranchises anyone, and I mean anyone, receiving monies from the treasury. Collect a social security check? Give up your right to vote. Collect welfare? Give up your right to vote. Collect a paycheck from the government? Give up your right to vote. No one should be allowed to decide their own pay when that pay comes from other people at the point of a gun. The worst part is that the population cylinder is also a voting cylinder. That is why politicians cannot enact reform. Because these are the politicians elected by the cylinder. The older voters will command the majority. They will thus burden younger workers enough to make them uncompetitive on the world stage. Japan may be producing some fine things. But the summary of their competitiveness is in the pudding. Is the economy growing? Are Japanese workers motivated enough compared to the rest of the world to keep expanding the country’s industry ? No. At least not at growth rates that are even remotely comparable to the world average. They are therefore in decline. America is on the same trajectory of transforming the incentives of its workforce to a less motivated and uncompetitive mass of voter-lemmings. 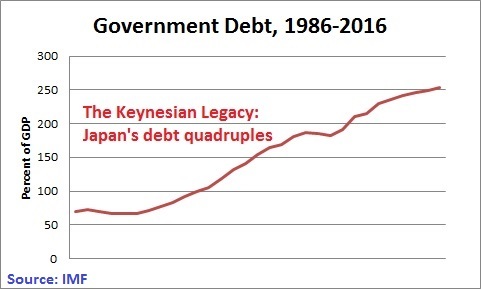 The time for Japan (and America) to control growth of government was when things were going well. In the grip of decline, it’s too late now.